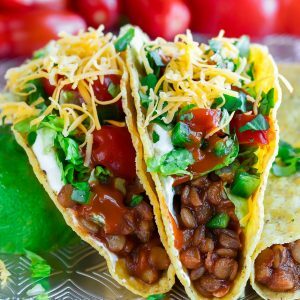 Chipotle Lentil Tacos - Tasty Vegetarian Tacos with Twist! 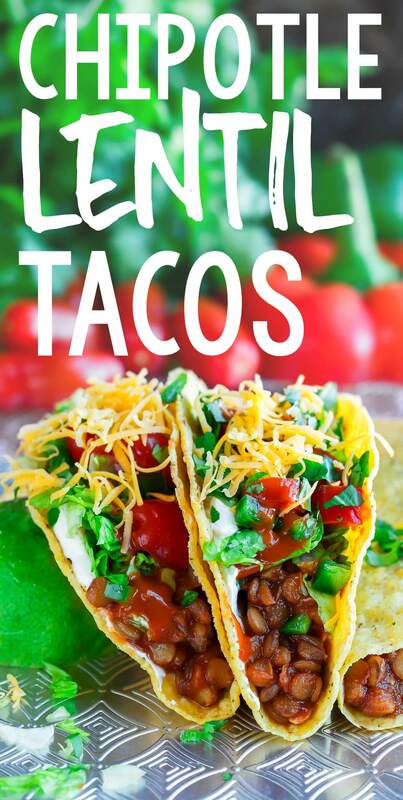 Chipotle Lentil Tacos turn this tasty vegetarian swap into an instant taco party! They’re packed with protein, have literally half the fat of their meaty counterparts, and are totally delicious! Let’s get our taco on! I’m not sure if it’s just the places we’ve lived and visited over the years, but why do I never ever see lentil tacos on a menu? If your reasoning is that they are not real tacos, well friend, I was starting to have my doubts as well. Maybe they’re not really a thing. After all, the only place I’ve ever seen them is in my own kitchen so…. But here’s the thing: OF COURSE they’re real tacos. Tacos really only need two things to be a taco in my book: tortillas and toppings. Corn tortillas, flour tortillas, crunchy or soft… it matters not. Just give me some taco shaped situation for me to stuff an abundance of toppings in and I’m as happy as can be. Pass me a margarita while you’re at it and I’ll be even happier! These chipotle lentil tacos are seriously baller. They’re a speedier, simplified version of my lentil veggie tacos with an added kiss of chipotle goodness thrown into the mix. After devouring the tacos from the above photo I called my neighbor and professional taste tester (lol! ), Jen, to come snag a few for lunch. She ensured me that lentil tacos are most definitely a thing (take that, Taco Bell!) and gave these babies a big thumbs up as well. We completely crazy for them and I can’t wait for you lentil loving ladies and gents to get these tacos into your faces as well! Yields 2-3 cups of saucy seasoned lentils, perfect for taco night! 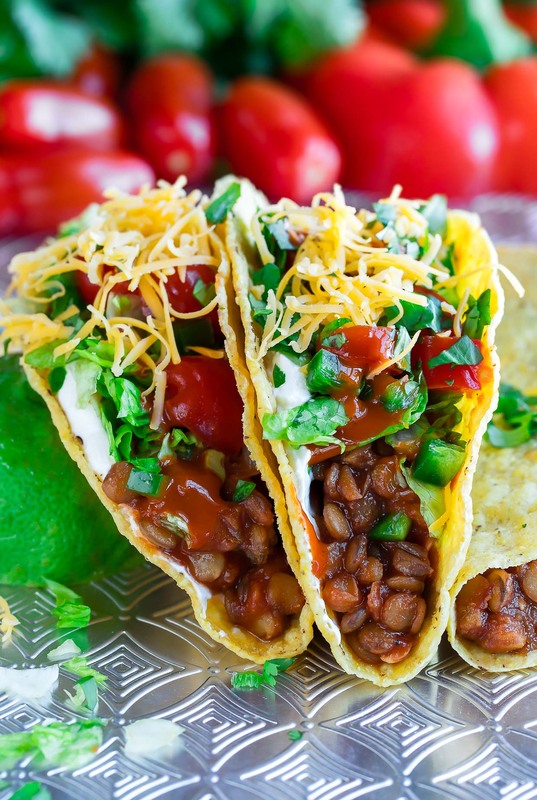 Chipotle Lentil Tacos turn this tasty vegetarian swap into an instant taco party! They’re packed with protein, have literally half the fat of their meaty counterparts, and totally delicious too. Choosing vegan options for the toppings and either skipping or veganizing the aioli will make these tacos gloriously plant-based! I also love them with a little vegan sour cream on top. Delicious! all your favorite toppings from the list below! Rinse and sort 1 cup of lentils. Heat 3 cups of water in a pot until it's just about to boil, add lentils and reduce to simmer. Cover with the lid slightly tipped to vent and simmer for 15-20 minutes or until tender. While the lentils are simmering, you'll have enough time to get your taco shells and toppings ready so everything is good to go in about 25 minutes! To make the sauce, simply combine ingredients and blend! Feel free to add extra chipotle pepper or adobo to taste if you like a crazy strong chipotle kick. It's best to start out small and then add as you go. I used an immersion blender to make my sauce and the recipe works great in a small food processor too. No blender? No problem! You can use the adobo sauce to season the aioli or mince your peppers really small by hand if you'd like. Both options will add lots of smoky flavor. Simply adjust amount to taste. Aioli TIP: I like to dive in with a tortilla chip and give the mixture a taste. Adjust smokiness and heat level until you reach your perfect level of deliciousness and then load up those tacos, yo! Once the lentils are ready, drain them over the sink and return to the pot. Add salsa, hot sauce, adobo sauce, and taco seasoning blend. Mix well and warm over low heat until the mixture's hot and ready! Assemble your tacos and dig in! Since they hold their shape the best, I totally suggest using brown/green lentils for these tasty tacos! While the smokiness and bold flavor is controlled by the chipotle peppers and sauce, the heat is mostly controlled by the cayenne. Feel free to use paprika in place of the cayenne if desired. The aioli recipe makes about 3/4 cup of sauce. Feel free to halve the recipe if you only want a little. Leftover taco filling can be used to make the most delicious vegetarian quesadillas the next day or be frozen for some rainy day “fast food.” Woot! If you get a chance to try these chipotle lentil tacos, let me know! looking for more lentil recipes? WOW. This was delicious!!! I ate the entire recipe by myself over the course of a week and never got sick of it. Then I put the lentils in a quesadilla. So good. There is something about warm tacos with cold, crisp veggies that makes me happy. This is a super simple recipe that has become a part of my regular freezer meal rotation! The filling is definitely hearty. 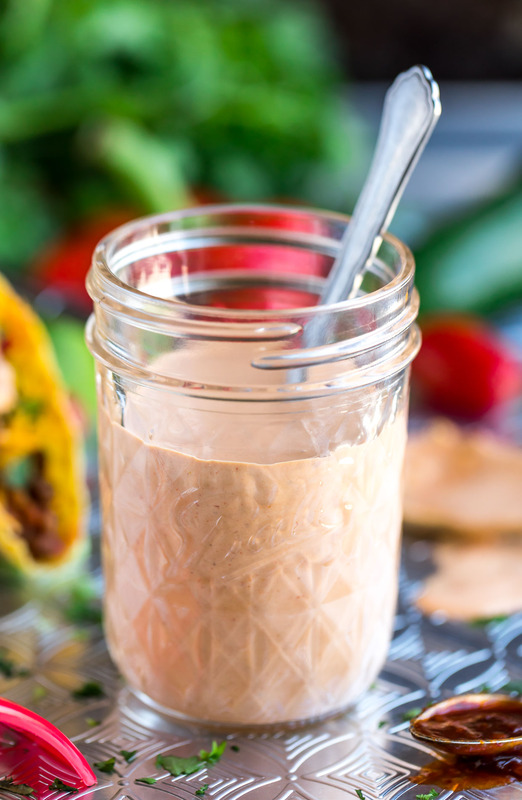 The Chipotle Aioli is quite zesty and adds an amazing pop to the recipe. I actually made extra for salads. This is one of those meals that I not only feel good about serving but look forward to serving because it is a hit with everyone in the house. Great idea using extra for salads! Love how much you’re enjoying this one — thanks chica!!! oh my gosh, those look absolutely amazing! These are absolutely gorgeous tacos! What a great Meatless Monday dinner! There’s a restaurant here, Coastal Taco, that does amazing lentil tacos. I think you’d give them a run for their money though. Also the tiny human turns 2 (!!!!) on Saturday and we might do a taco party. If so, these will be on the menu. HOW IS SHE TURNING 2?! OMG! Girlfriend needs to slow her roll! Mine is growing like a weed as well and making me teary-eyed. Good to know lentil tacos are for sure a thing! 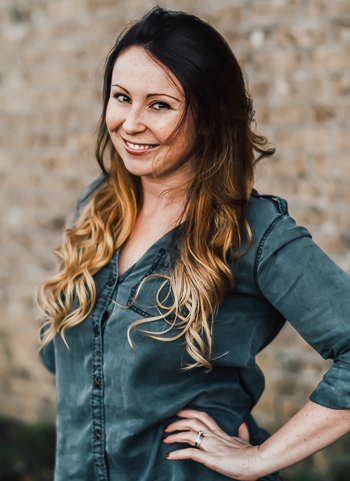 You have some amazing restaurants there – your IG makes me drool! Love you, ladycakes!